We left off in Ngongotaha, seeing refuge in the campsite kitchen from a huge downpour. 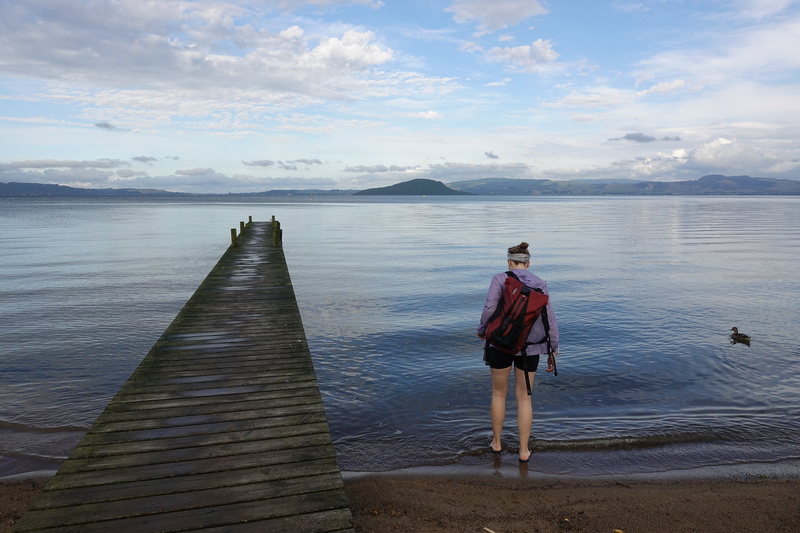 Later that evening, once the rain looked like hold off for a few hours, we went and explored the edges of Lake Rotorua and went grocery shopping for dinner and the next days. 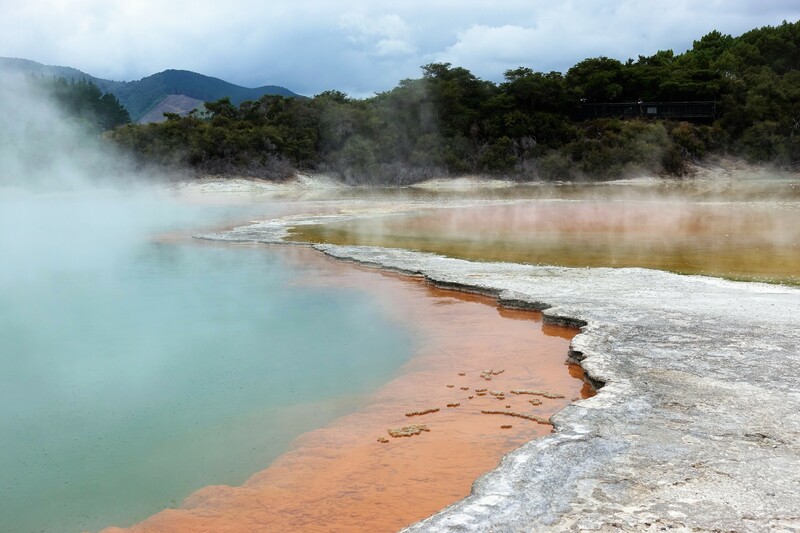 In the morning, Cédric and I set out to Rotorua, with the goal of reaching to the Wai-O-Tapu Geothermal park by lunchtime. 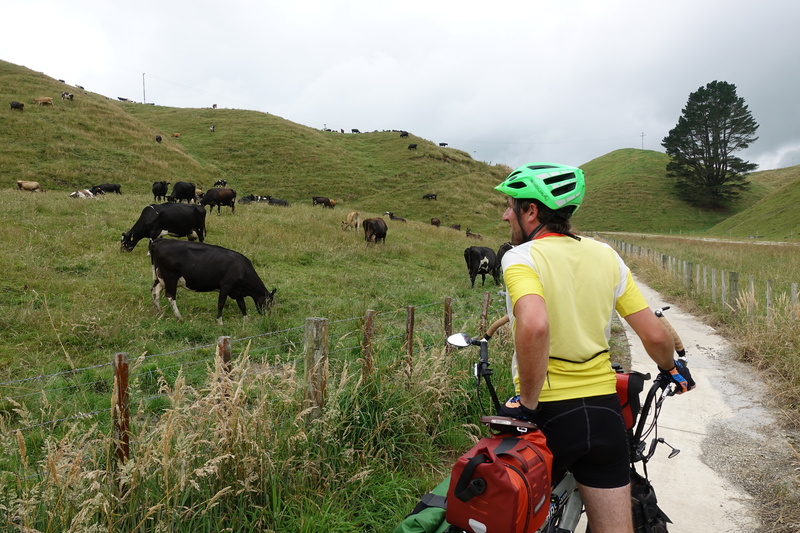 We had the luck of meeting a nice Kiwi road cyclist, who let us know of a cycle-way off the side of the state highway. 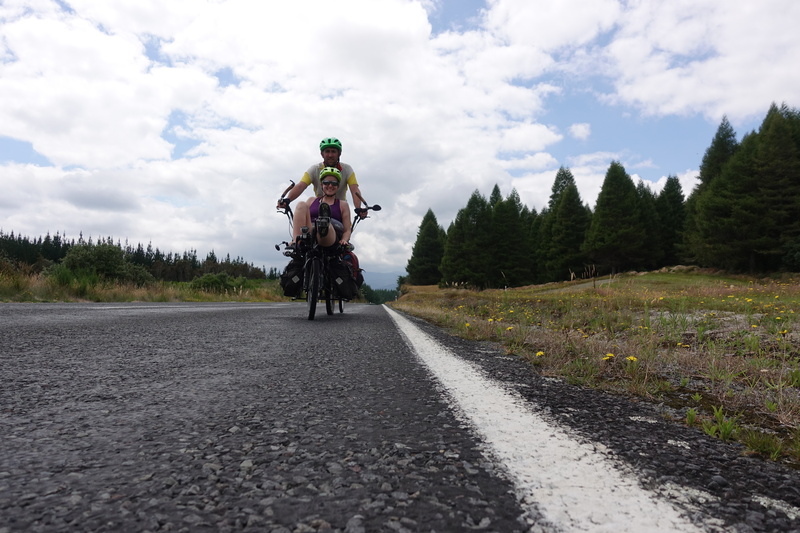 Although narrow, and with a few more hills than we would like, we were happy not share the road with the thousands of trucks and camper vans/RVs. The trail even took us off-roading through cow pastures for a bit. 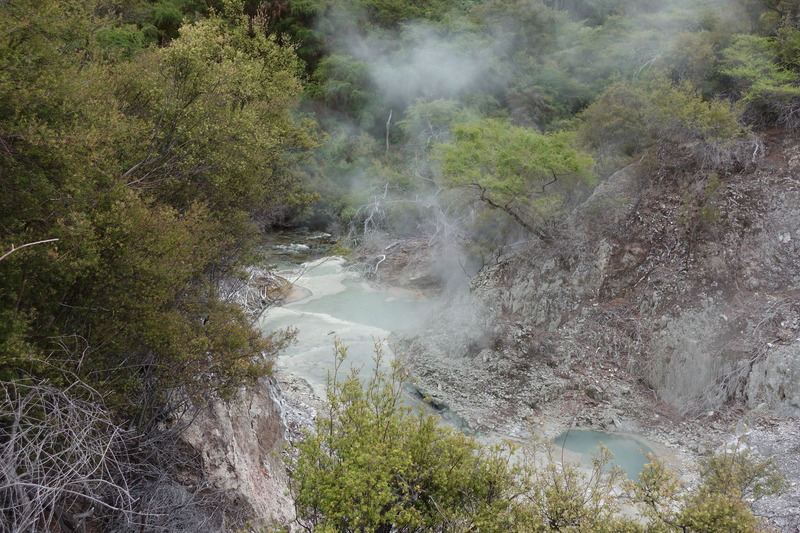 We reached Wai-O-Tapu around 1pm and it turned out to be a geothermal park that was less like Yellowstone and more like Disneyland with its manicured trails. 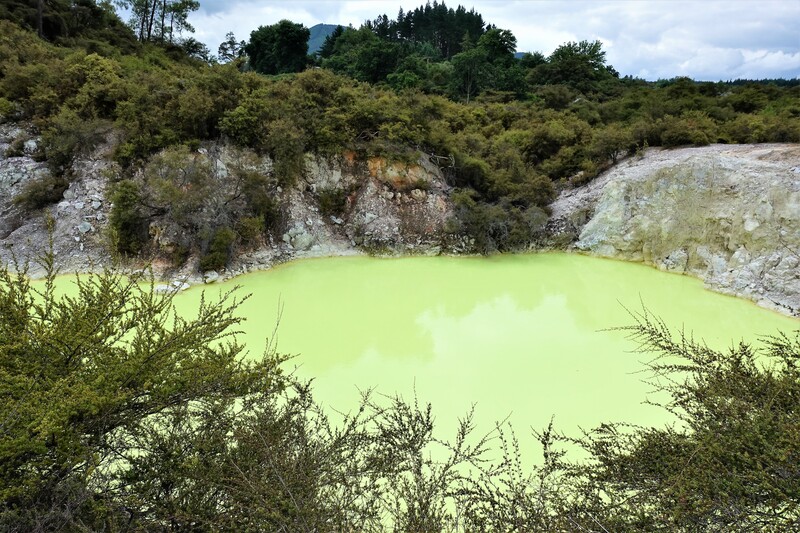 There, we followed a set path through sulfur mounds, hot springs, and acid green pools. Once we got back to our bike, Cédric caught the attention of a Hase Pino fan from France and convinced him on buying one himself (he, a pilot, also offered to fly us over the Reunion Island is we made it out there – we kinda forgot the name after sweating in the next few hills, but if “Felix ?” is reading, you’re welcome to follow us!). After the park, we biked through more cow pastures to Reporura to stop and take a Coke break. 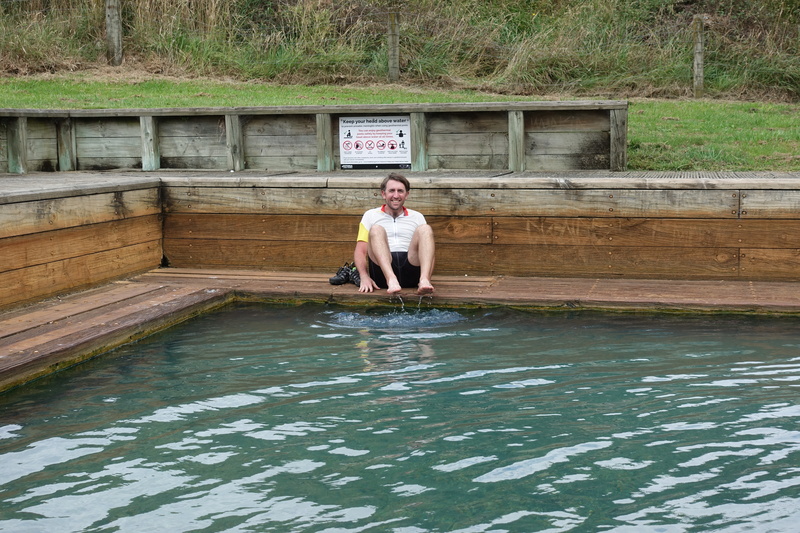 On the benches outside of the convenience store, we asked some locals if they could recommend a place to set up camp for the night and they tipped us off to some hot pools nearby and a spot along the Waikato river. As we were setting up our tent and getting ready for the evening, we were able to watch some locals barefoot skiing down the river. 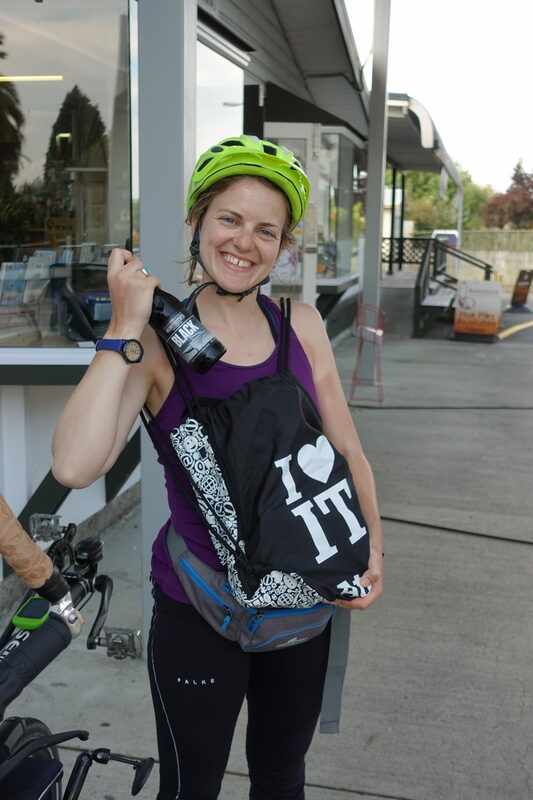 The next morning, we packed up everything and continued down the road to Taupo, a nice town on the shores of Lake Taupo. 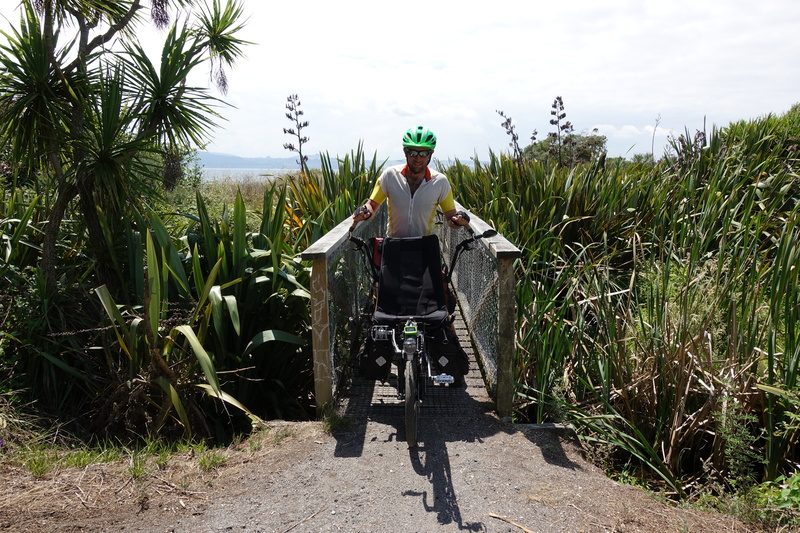 After lunch, we followed a bike path heading south on the eastern shore until it unfortunately merged with state highway 1 once again. 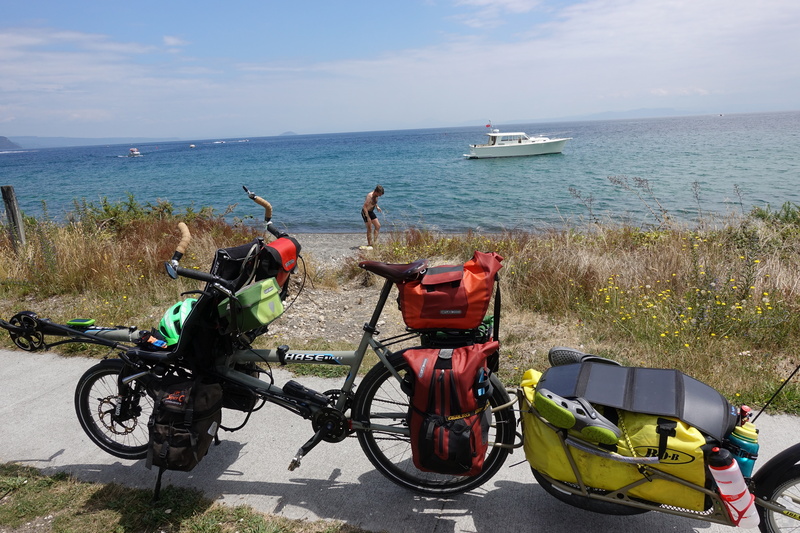 The morning had been some easy sailing through rolling hills, but that afternoon gave us larger hills and narrow lanes along the shore with a lot of traffic. We were happy to reach our great Warmshowers host – Kerry – in the early evening and share some beer, dinner, path suggestions, and stories with him before we turned in for the night. 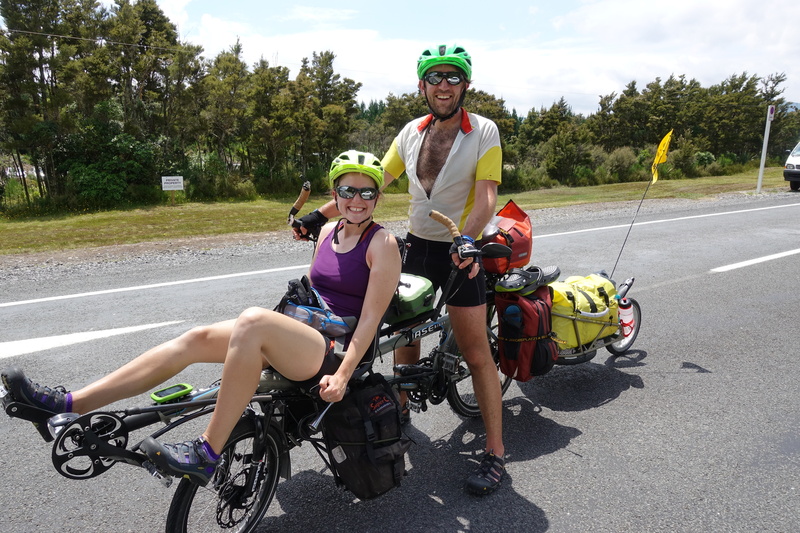 Today, the roads were very hilly once again, but we were able to turn off onto the quiet State Highway 46, where the few cars and campers passed us with much more room than we had received on the other highways. Zigzagging uphill with our load is also quite pleasant. 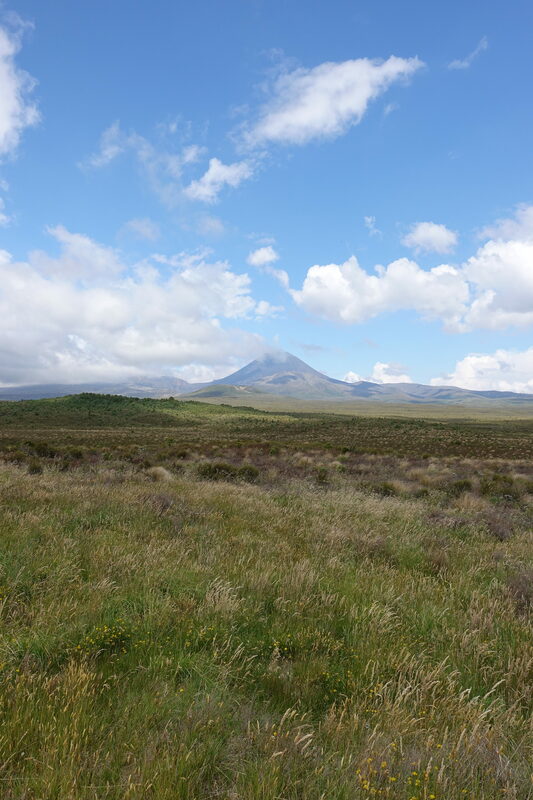 We’re near the Tongariro National Park right now and are planning to high the Tongariro Alpine Crossing. This place is also known as Mordor/Mt. Doom, thanks to the Lord of the Rings movies. Looking forward to beat up Sauron’s eye tomorrow morning! We look forward to seeing the pictures. Try to keep away from the trucks if you want Felix fly you over reunion island. Cedric your mum wants also Felix to fly her with you. Thanks for the news. Take care.